In the early to mid-oughts, minimal techno and tech house ruled most of Berlin’s dance floors. But alongside this more mainstream music movement, there was a parallel scene dedicated to playing records that were not played elsewhere. Seasoned house and disco DJ legends were invited, and gradually strong local and international networks began to plant roots and grow a culture dedicated to digging for more obscure and leftfield sounds. Styles like vintage house, Italo, post-punk, Afrobeat, Balearic, yacht rock and even more specialized musical niches began to dominate these scenes. The daring eclecticism of this community created an openness that later would go on to inspire many of the tracks that are being played in clubs and festivals today. Call Super and Hunee (pictured above) both came out of this world. And from 2010 to 2013, a club called Soju Bar was Berlin’s hotspot for this special corner of night life. It was located in the backroom of the Korean street food bistro Angry Chicken—itself an extension of the popular Kimchi Princess restaurant around the corner. The club’s sound system was above average, and the room was decorated with loving attention to detail and an impressive replica of Korean bar culture that made the room appear larger than it actually was. Hyun Wanner, one of the Kimchi Princess owners—who also happened to be on par with his DJs in terms of his enthusiasm for music—booked Soju Bar’s tasteful program until the club’s close. Like many small businesses in Berlin, it was forced to close and eventually became a part of a hotel in the same building. We asked Wanner to revisit some of Soju Bar’s most dedicated resident and regular guest DJs and pick the music that he associated with their nights. 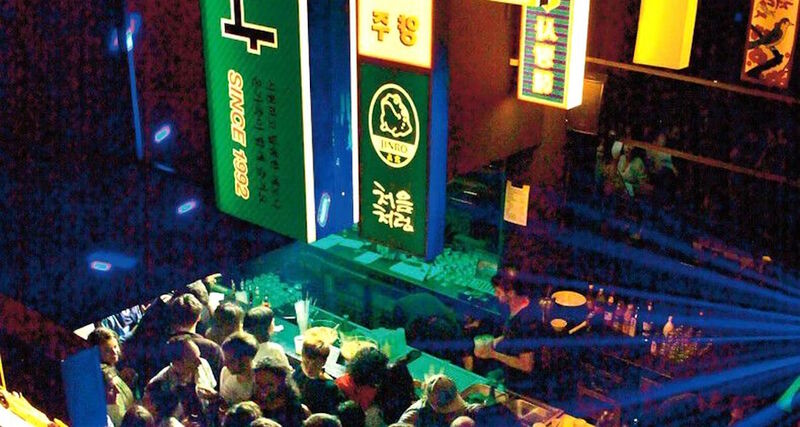 “When Soju Bar started, everything was really disco and balearic. Then, most DJs started to pick up housier vibes again. It was almost a bit like going through the history of dance music in one and a half years, and a few subsequent decades. This record contains all this history. It was first Soju Bar resident, DJ Filippo Moscatello, who introduced me to this record. I have funny memories of this track. For example, it was an incredibly hot night, and it was really empty, but a few people were dancing for hours and didn’t want to leave. Joel was the only DJ, and he’d already played six hours for the same 15 people. “This is a great edit. Hugo played this when he was warming up for Nathan Gregory Wilkins on whose History Clock label it was released. It was the era of edits, everybody was releasing them. Not every edit was as good as this one, though. Sometimes I didn’t understand why some people had the arrogance to touch a classic and think they could turn it into something better.